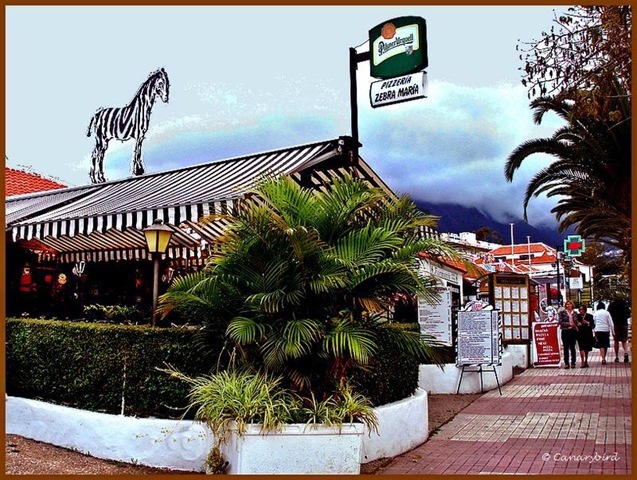 Located on the main Carretera Botanico in the La Paz area of Puerto de a Cruz, across the street and down from the Hotel Botanico is the Pizzeria-Restaurante Zebra Maria. 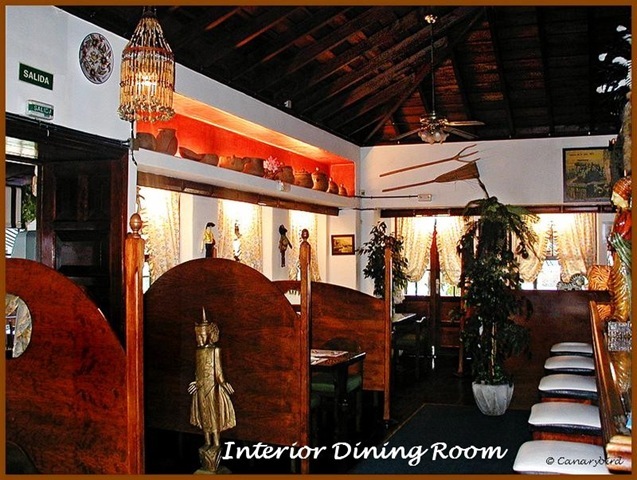 A popular restaurant for over 25 years, it has been one of the few that stays open through from 13:00 until 23:30. The four separate dining areas are comprised of: the outer patio and side enclosed gallery, both which are smoking areas, to the windowed porch at the entrance and the interior dining room which are smoke-free. Here you will see groups of both Spanish locals and tourists ordering from their menu of pizzas, pastas and international food. 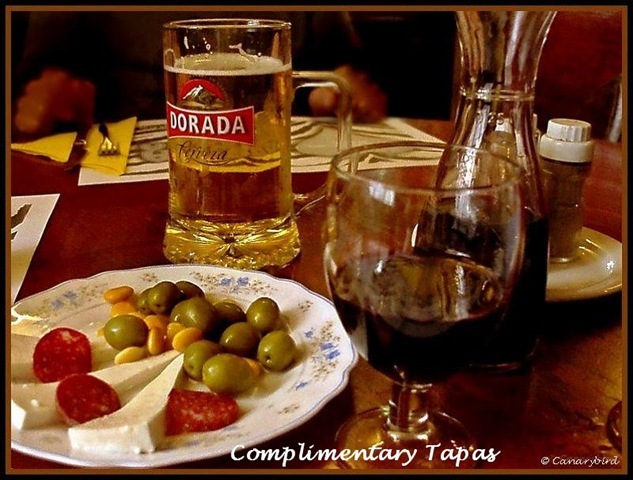 Along with your drinks comes a starter dish of cheese, olives, maiz and chorizo nibbles . Good for a starter are the thick rounds of toasted garlic bread. Thin, crispy pizzas come in seven varieties, ranging in price from €6.00 to €8.00. 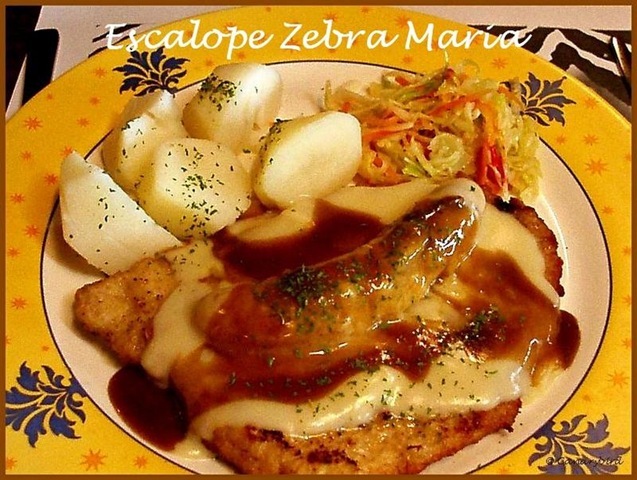 My favourite is the Pizza Cariñosa, with onion, chicken, cheese and ham.One dish which has been on the menu for many years is the Escalope Zebra Maria, a pork schnitzel topped with baked banana, bechamel and gravy, served with chips and cole slaw. I especially like the shrimp cocktail, which is served in an elegant presentation bowl. 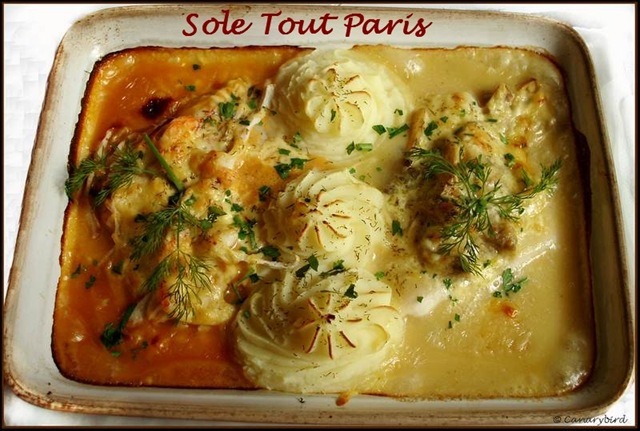 The Sole Tout Paris, similar to the Sole Walesa, is topped with shrimp, lobster sauce, bechamel and piped potato. 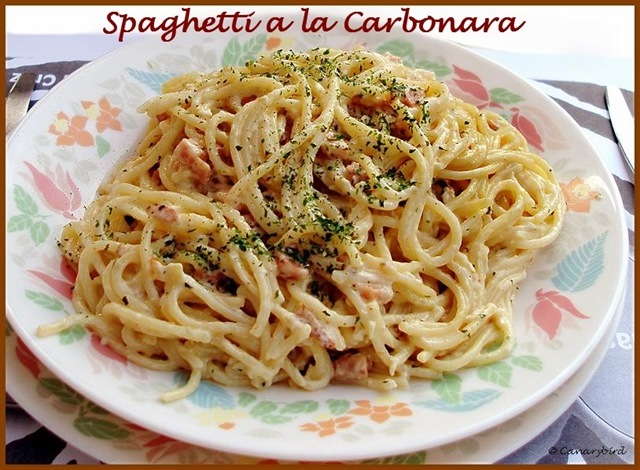 Spaghetti a la carbonara is another dish they do well. 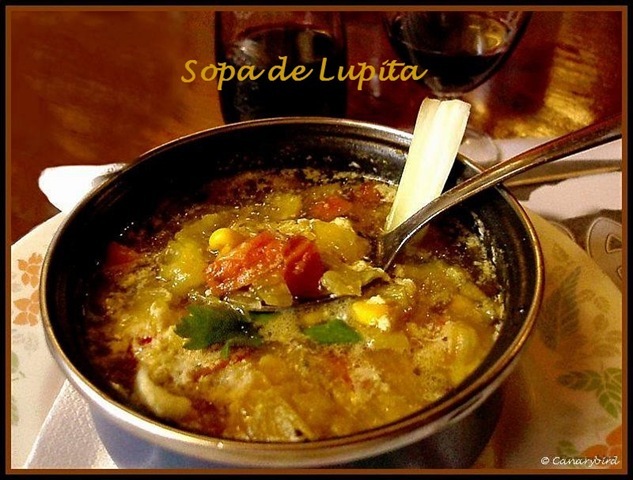 The thick vegetable soup topped with egg, “Sopa de Lupita” is delicious and is almost a meal in itself. Solomillo Robin Hood is another good dish, accompanied by mushrooms, chips and gravy. 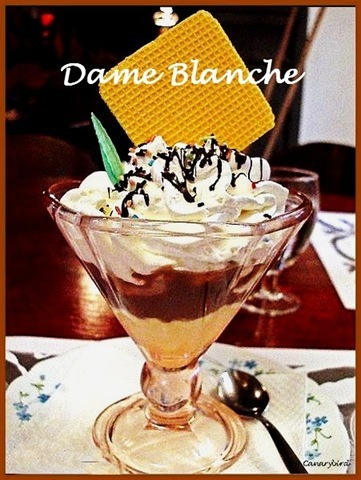 Dame Blanche is a rich chocolate ice cream dessert. Some prices: Solomillo €14.00; Sole Tout Paris €12.50; Escalope Zebra Maria €10.50; Shrimp Cocktail €10.50; Spaghetti a la Carbonara €7.75; Two bratwurst sausages with potatoes and red beet salad €7.00; Eggs, bacon, tomato, fries €5.00; Garlic Bread €3.00; 1 CCC beer €2.00; Glass of house wine €2.50; Cafe cortado or solo €1.30. The service can sometimes be a little slow, so go there when you have plenty of time. Otherwise I would recommend this restaurant, especially for the dishes mentioned. Pay parking charges inside supermarket or free if you buy something there. 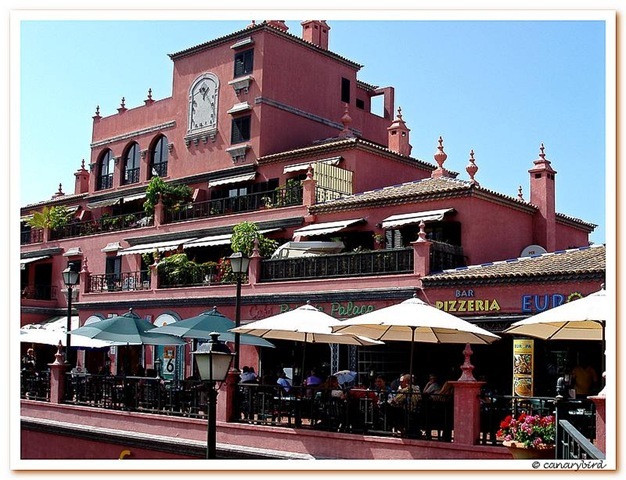 If you have been to visit the Botanical Gardens in Puerto de la Cruz (Jardin de Aclimatacion de la Orotava) and are feeling ready for lunch or dinner, you will find a good meal just across the street at the Bar/Restaurant Botanico Palace. Situated in the centre of the ground floor of the pink building, this popular restaurant opens at 8’oclock in the morning and closes at 12 midnight seven days of the week. The outdoor terrace, shaded by green parasols, affords a peaceful view of verdant lawn and olive trees. 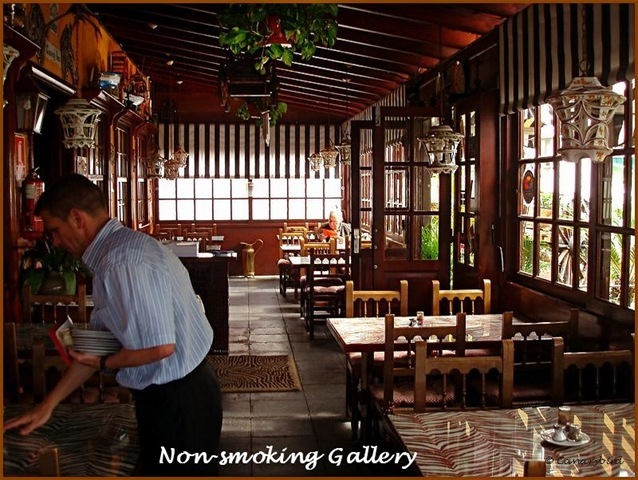 Indoors, where smoking is permitted, you have a choice of small tables or seats at the long bar. This is a family business with much experience. The restaurant owner’s father, who is also the chef, is a well know local man who used to run the Cafe Berliner in downtown Puerto de la Cruz. The female waiting staff is friendly and efficient. 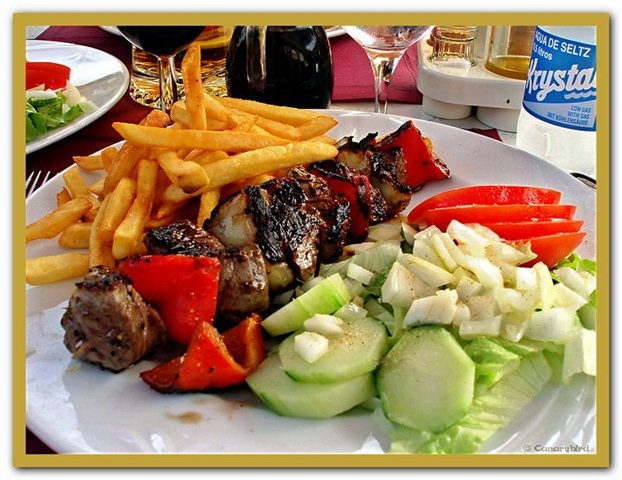 Your food is on the table quickly and the whole impression one has is of a popular Spanish restaurant where many locals come to meet, eat and later play dominos and cards during the slower hours. 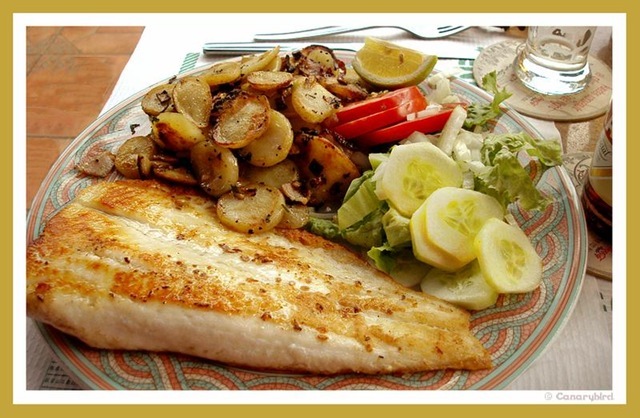 There is a daily special on the chalkboard as well as a complete menu printed in several languages. Today’s ‘menu del dia’ was shoulder of lamb with potatoes and vegetables for €10.50. 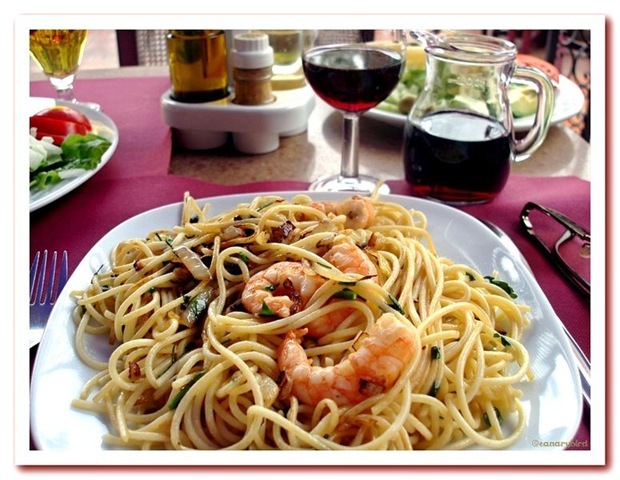 Some of our favourite dishes there: Spaghetti with prawns & garlic €8.00, Filetsteak brochette €8.50,Breaded escalope of chicken €7.50, Filetsteak with peppersauce €12.50. 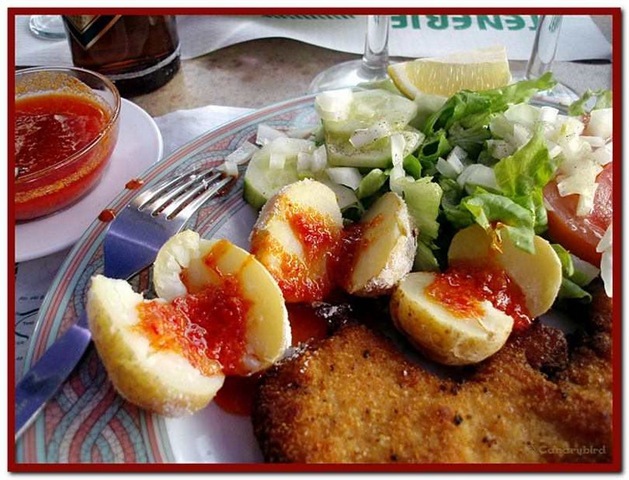 I have to comment on the fact that the salad accompanying many dishes is always crisp, fresh and appetising and the serving of papas arrugadas to accompany a dish is a generous helping of six or more potatoes. Their mojo sauce is delicious! More prices: 1 Dorada beer €1.50, Ham omelette with salad €4.50, 1 glass house wine €1.50, Cafe cortado €1.00, Cafe con leche €1.50. There is a dessert cooler filled with cakes, tiramisu, chocolate mousses and other treats as well as ice creams. This is a nice place to go just for an unhurried coffee or drink with friends if you aren’t yet hungry. We always manage to find a parking space nearby in the street. Opening hours: 8 am to 12 midnight, every day including Sundays. 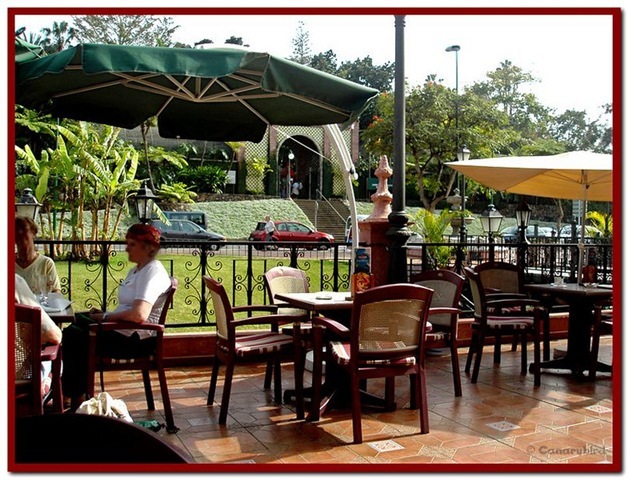 Location – across the street from the Botanical Gardens, Puerto de la Cruz. The Mental side, where does it start ? Thinking of having a great round on the golf course can be a lot of mental work. The most important part of having a great round on the golf course begins with a few thoughts……..Question is where and how many? Preparing your mind for a great golf game can be quite time consuming and unhealthy, depending on where you start your mental game. Triggering your thoughts for a great game of golf should not be in the car on the way to the golf course. If you’re approaching a curve ahead of you going downhill on a slippery roadway, and you see a sharp curve ahead of you. Do you start thinking on how you are going to fly the bunker on the first hole? Trying to dream up a great game of golf in a coffee house can have your lips seared with hot coffee as well. Thinking of sinking that long 30-foot putt on the first hole, while having dinner out with your wife or girlfriend, could have that same coffee all over your lap. Trying to conjure up a great game of golf, while doing other things at the same time. Does not work! No matter how good you are! For some of us trying to play a golf hole in our mind is our way of preparing ourselves for the game to come. Thoughts on visualizing how you plan on conquering the fifth, or seventh golf hole that you always seem to have trouble with, could have you playing it over and over again in your mind, until you get it right. I think it gives us the self-satisfaction before we approach the notorious golf hole, that in our mind we have conquered the golf hole the night before. Have you ever lost sleep the night before trying to conjure up a great round of golf for the next day? The thoughts of having a great round of golf, and a good game plan, should start on the first tee box, looking down the fairway and visualizing the shot at hand. If you start thinking of anything other than where you want the ball to land on your shot at hand. You will find yourself scratching your head, and thinking of where you went wrong. Thoughts on a good game plan should be on your immediate task at hand. Most of us have been told to play one golf shot at a time. I think the same would apply on playing one golf hole at a time, taking one curve on the roadway ahead of you at a time, and taking one sip of coffee at a time, and leaving your golf game plan thoughts at home when you go out for dinner.